This video was made in Genoa Italy with Craig Fraser, and Steve Vandemon. Besides getting a pretty good step-by-step of a killer airbrushed hood mural, with tribal graphics, flames, realistic fire, and pinstriping. You also get a chance to see Craig Fraser butcher the Italian language almost as bad as he does the English, in the first ever Bi-Lingual kustom paint video. 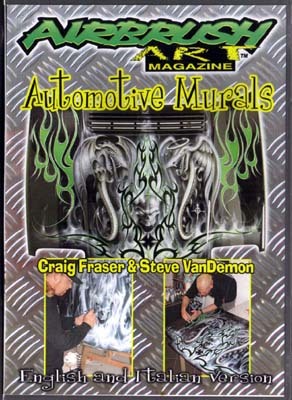 It is also the first video ever shot with Craig Fraser, and Steve Vandemon using a water based automotive paint system. JVR Ammonia/Water Bournes. This video is only available in the U.S.A. through Dave Monnig at Coast Airbrush. You find one of those mail-order discount houses selling it,....it's a bootleg. You want to get good equipment, resources, and materials with a knowledgeable sales staff, there is only one place to shop: Coast Airbrush.